1Laboratory of Plant Biology and Environnement «Médicinal Plants» Axis, Faculty of Sciences University Badji Mokhtar- Annaba. BP 12, 23000 Annaba, ALGERIA. 2Laboratory of Pharmacognosy Av. Vicente Andrés Estelle s / n 46100 Burjassot, Valencia, SPAIN. Aim: Calendula suffruticosa ssp. suffruticosa Vahl, Medicinal and Aromatic plant, spontaneous and widespread in the Mediterranean region and in the Northeast of Algeria, is widely used by the local population for its medicinal properties. Methods: The chemical composition of the ethanolic extract of Calendula suffruticosa was established for the first time using GC / MS. 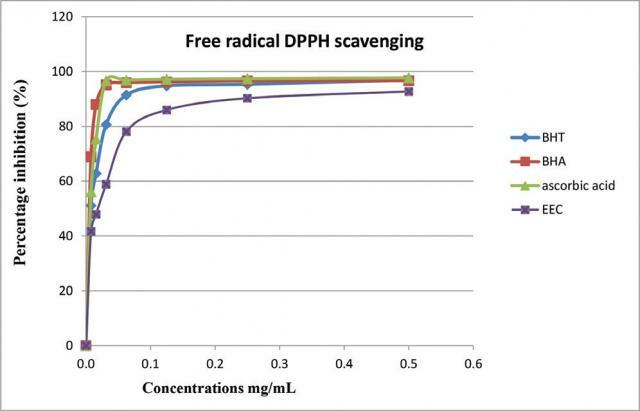 The antioxidant activity of the ethanolic extract was evaluated in vitro by the DPPH (2,2-diphenyl-1-picrylhydrazyl) test, the FRAP assay and β-carotene bleaching assay. Results: sixty-four compounds are identified by GC/MS analysis, six are predominant: α-linoleic acid (24.20%), linoleic acid (23.58%), Stigmasterol (8.53%), 2-Metyl-Z-4-tetradecene (6.62%) And α-Bisabolol (1.70%). The free radical scavenging by DPPH method indicated that the ethanolic extract of C. suffruticosa showed a very high antioxydant activity with an IC50 = 0.017 ± 1.00 mg / ml. This extract also showed an ability to reduce very high iron with a maximum optical density of 1.157 at a concentration of 0.5 mg / ml and an antioxidant activity compared to the β-carotene / linoleic acid test of order of 75 ± 1.02%. Conclusion: These results show for the first time the richness of phytochemicals and the strong antioxidant activity of the species Calendula suffruticosa endemic to north-east of Algeria. Ismahene S, Ratiba S, Miguel CM, Nuria C. Phytochemical Composition and Evaluation of the Antioxidant Activity of the Ethanolic Extract of Calendula suffruticosa subsp. suffruticosa Vahl. Pharmacognosy Journal. 2018;10(1):64-70.